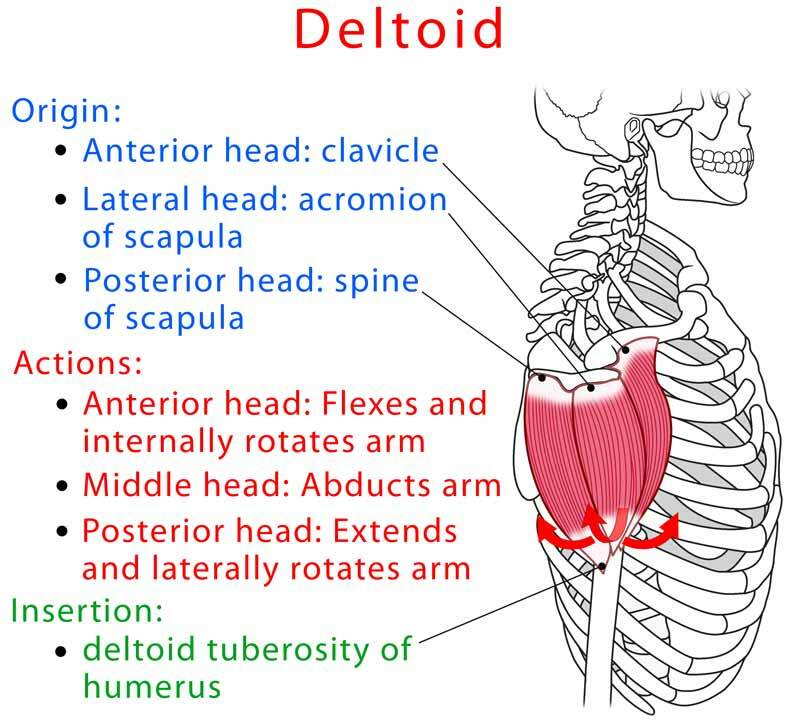 Deltoid is one of the main shoulder muscles that extends from the top of the shoulder to the side of the upper arm. The anterior head flexes and medially (internally) rotates the arm at the shoulder joint. The middle head abducts (elevates laterally) the arm at the shoulder joint. The posterior head extends the arm (backward) and laterally (externally) rotates it at the shoulder joint. Pain in the deltoid muscle can be caused by a contusion caused by a blunt injury, muscle strain or tear or due to a nerve injury (an injury of the brachial plexus or a spinal nerve compression due to a herniated disc in the neck). Deltoid strain or partial tear can be caused by excessive forces acting on the muscle, such as during weightlifting or butterfly swimming. Complete deltoid tear is very rare and occurs only in severe injuries, such as motorbike accidents . Deltoid strain causes tenderness and deltoid tear a sudden sharp pain in the shoulder . Raise an arm sideways, so your elbow will be at the height of the shoulder, and bend the elbow, so your hand will point forward. To test for strength of all 3 deltoid muscle heads, an examiner will ask you to push the arm forward, upward and backward against the resistance of his or her arm (Video 1). Decreased strength–as compared to the opposite side–speaks for deltoid muscle or nerve injury. A doctor can make a diagnosis of a deltoid tear from physical examination and magnetic resonance imaging (MRI). Initial treatment can include rest from painful activities, a compression bandage, ice packs several times a day (in the first 48 hours) and painkillers . When pain subsides, a physiotherapist can recommend stretching and strengthening exercises. In severe tears, surgical repair may be needed .